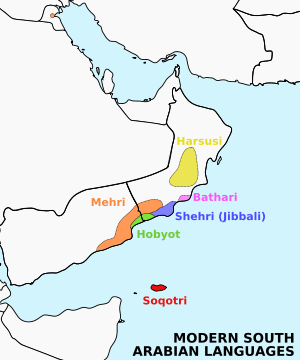 Bathari is an Afro-Asiatic language of Oman, located on the coast facing the Khuriya Muriya Islands (17°40′46″N 55°22′19″E). The language is very similar to Mehri and some members of the Bathari tribe speak Mehri instead of Bathari. The first westerner to discover the existence of Bathari was Bertram Thomas in 1929. The name Bathari has been variously rendered: Batahari, Bautahari, Botahari, Bathara. The Bathari language is nearly extinct. Estimates are that the number of remaining speakers are under 100. In addition to the threat of Arabic, Mehri also threatens to replace the language due to its less prestigious position. 1 2 3 "MSAL Project Information" (PDF). University of Salford. Retrieved 30 April 2015. ↑ Hammarström, Harald; Forkel, Robert; Haspelmath, Martin; Bank, Sebastian, eds. (2016). "Bathari". Glottolog 2.7. Jena: Max Planck Institute for the Science of Human History. ↑ Steska, Mike. "DICE Questionnaire - BHM" (PDF). University of Missouri. Retrieved 30 April 2015. ↑ Stroomer, Harry; Johnstone, Thomas M. (2004). Harsusi Texts from Oman: Based on the Field Materials of T.M. Johnstone. Otto Harrassowitz Verlag. p. 1. ISBN 9783447050975. ↑ Simeone-Senelle, Marie-Claude (1997). "The Modern South Arabian Languages" (PDF). The Semitic Languages: 378–423. Bathari Engdangered Languages Profile (Endangered Languages Project). Bathari Word List (Bathari Word List of 40 Words).